Product Description: This is called an air conditioning dryer. It is used to filter and remove moisture from the air conditioning system. The dryer is placed in series with the output or pressure side of the compressor, located after the condenser in front of the radiator. This dryer also has a safety switch which is used to protect the AC compressor depending upon the system pressure. The safety switch is located on the top of the dryer as shown in the photo to the left. 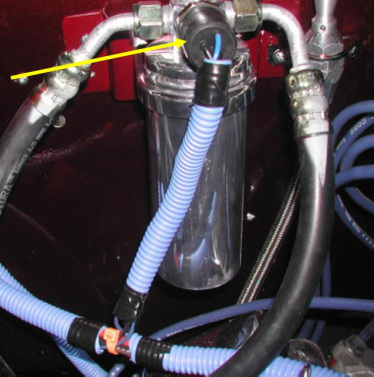 It is used to disconnect the electric clutch on the compressor in the event of either too high or too low of pressure. It also closes a circuit to start the electric fan. This type of switch is called a trinary switch.